He was speaking the truth. What the lady shared was beyond his belief system. But does this really mean that it did not contain truth and value for her? This situation made me reflect upon how many times in the past I have held strong beliefs about life and people—only later to be proven wrong. Recognizing this now, makes me more open to considering all possibilities. The Oxford dictionary defines belief system as “A set of principles or tenets which together form the basis of a religion, philosophy, or moral code.” So, really it is a mental construct of thoughts and perceptions that we hold dear as truth and that help us make sense of life and the world around us. We tend to mix with people of similar values and belief systems, which gives us a feeling of safety, comfort and being right. When questioned, we vehemently defend our beliefs, sometimes with great passion, as if our very lives were at stake. It’s true—life as we know it is at stake! I came across an article published by the BBC in 2016 that says the well-known rapper, B.o.B, has been on a mission to convince his Twitter followers that the Earth is flat. 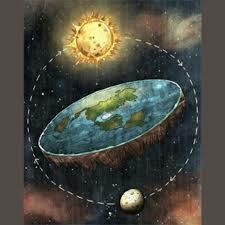 Researching a bit more, I discovered that there is a whole subculture of people who believe that the earth is flat. They believe they are right and everybody stating the contrary is wrong. What beliefs may you be clinging to—philosophical, scientific, religious—that may not necessarily be the ultimate truth? How can you be so sure that there are not possibilities outside of your belief system, outside of what feels comfortable to you right now? I have noticed that when many of my clients hit a crossroad, such as being confronted with an illness, a relationship break-up, or some sort of loss, they realize that their belief systems are inadequate. This is sometimes the moment when they are willing to challenge their belief system, step outside of their comfort zone and try something new, like an alternative healing modality, or something else that they may have previously poo-pooed. As a result they experience an expansion of consciousness, transformation, healing, a greater level of empowerment with the ability to create a life they may have previously only dreamt of. They gain a larger, more expanded view of life with a greater level of inner and outer freedom. Why wait until the mack truck hits us, before opening to new possibilities?